Halong Bay is located 160 km from Hanoi, this would take you about 3 – 3.5 hours in a private car to Halong city. People can either choose the shuttle bus service or Private Car Transfer to get there. Below is the cost of the Round trip transfer from your hotel in Hanoi to Halong Bay and return. Shuttle Bus: It costs you approx. $10/ per person for 1 way. The 29 seat shuttle bus will pick you from your hotel, on its rounds of Hanoi picking up all customers and also transfer you back to your hotel in Hanoi after the trip. You will share the bus with other people from different hotels so the departure time will be anywhere from 8am – to 9am. you need to be ready at your hotel lobby at from 8am. It is more economic when a single person is traveling. Private Car: Using a private car is more convenient and more flexible. Our driver will be waiting for you at your hotel lobby at 8.30am. The travel time is shorter because you don’t have to wait for others, and it allows you some breaks for photographs, refreshments or a toilet stop along the way. Rates for transfer from Hanoi (center) to Halong Bay (2- way). Usually, there are 3 kinds of vehicles: 4-seater cars for maximum 3 passengers, 7-seater for maximum 5 passengers and 16-seater for maximum 11 passengers. (this to allow room for your luggage). Question: Best way to get from Hanoi to Halong Bay? 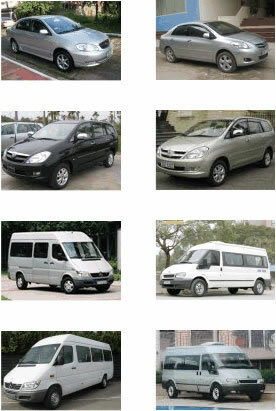 Answer: Private car will be the best choice for you. You can instruct the driver to stop at any time to take photos or rest.